Five Bornean elephants were collared from 4 to 6 June near the Danau Girang Field Centre, in Lot 5 of the Lower Kinabatangan Wildlife Sanctuary. Danau Girang Field Centre is a field study centre located within the Kinabatangan. It is a collaborative project between the Sabah Wildlife Department, Cardiff University and the non-government organisation HUTAN. A Malaysian PhD student Nurzhafarina Othman registered at Cardiff University and Mexican wildlife veterinarian Dr. Diana Ramirez from department’s Wildlife Rescue Unit have led the collaring operations. They also re-collared a female named Putut that was previously tagged in October 2011 as well as three new females named Ita, Bell and Tess and one male of 30-40 years old named Sejati. The three new females were selected by Nurzhafarina for her PhD study on the social behaviour of the Kinabatangan elephants. The five individuals bring the number of currently tracked elephants to eight. According to Nurzhafarina Othman, the objective of collaring is to collect additional movement data from different individuals to facilitate the management of the Bornean elephant in the Kinabatangan. Apart from that, it also determines the social associations among females using GPS points, especially highly related females, that are an important component of her PhD study. 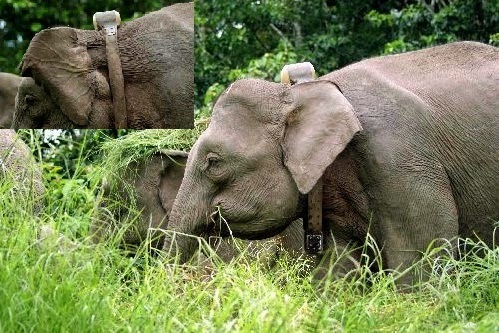 Nurzhafarina told that three females, Putut, Bell and Tess were fitted with collars provided by Dr Shermin de Silva, from Sri Lanka, with whom they are collaborating on female behaviour. The dedication towards wildlife conservation and the commitment from the two women got praise from Director of Danau Girang Field Centre, Dr Benoit Goossens. This project was funded by the Asian Elephant Conservation Fund from the U.S Fish and Wildlife Service, Mohamed bin Zayed Species Conservation Fund, Elephant Family, Houston Zoo and Columbus Zoo.